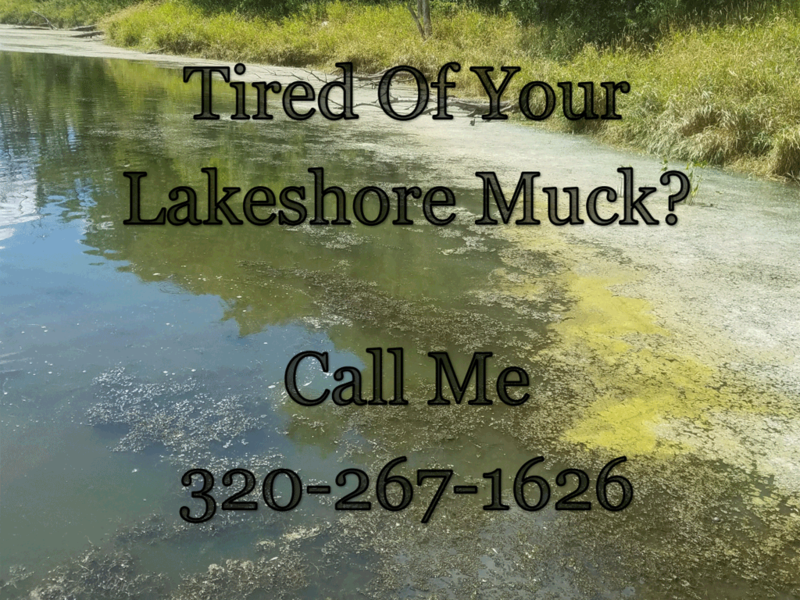 We offer high quality Walleye, Yellow Perch, Black Crappies, Smallmouth Bass, Largemouth Bass, Hybrid Bluegills, Bluegills; some pellet trained as well as fathead minnows. Our fish are certified disease free, including VHS. We are a family owned and operated fish farm that specializes in providing high quality cool water fingerlings for pond or lake stocking. We personally handle all fish to insure proper care. Our fish are certified disease free, including VHS. We have been in the fish growing and delivery business since 1992. 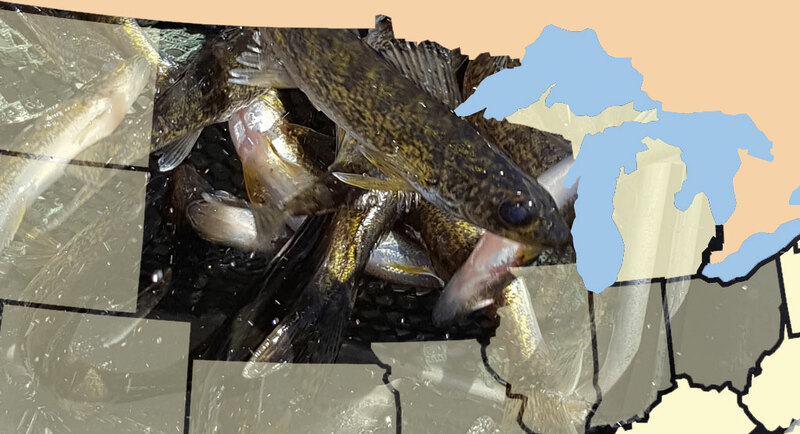 We deliver fish to many of the great lake states. With another season right around the corner, it is time to think about restocking and adding feed to your pond again. If you have any questions on equipment availability or would like a price sheet, please fill out the contact information form. 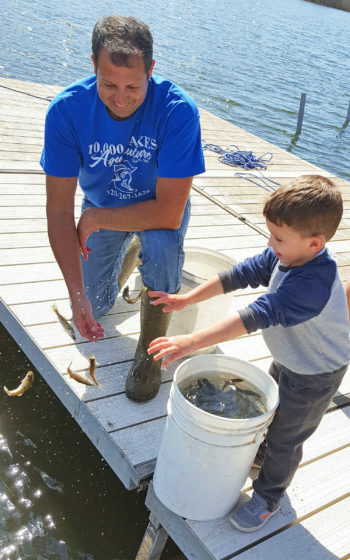 At 10,000 Lakes we offer high quality Walleye, Yellow Perch, Black Crappies, Smallmouth Bass, Largemouth Bass, Hybrid Bluegills, Bluegills; some pellet trained as well as fathead minnows. Different species work better in certain habitats and with the experience we have gained in growing our fish we can make recommendations for your pond or lake. We also offer a small line of areation equipment to help your fish maximize their potential. Spawning: From mid-April to mid-June they construct nests near shore in water from 1-15 feet deep. They prefer sandy or gravel bottoms, but they will use any type. Food: Adults eat crayfish, frogs, large insects, and fish. Adult size: Normally 12-15 inches and can weigh 1-3 pounds, but can reach 10 pounds. Spawning: From mid-April to mid-June they construct nests near shore in water from 1-15 feet deep. They prefer silt-free, sandy or gravel bottoms, but they will use any type. Spawning: Occurs from mid-April to early May. Eggs are deposited in adhesive bands over vegetation or on the bottom. Food: Adult aquatic insects, larvae, and small fish.Adult size: Normally 5-12 inches and weigh 1/4 – 1 pound; can exceed 2 pounds. Spawning: Normally during May to June and nest in and around brush, rocks, or vegetation in water 1-5 feet deep. Food: Young crappies feed on zooplankton and larval insects during their first year of life; as adults they switch to a diet of small fish. Adult size: Usually 6-12 inches, but can reach lengths of up to 18 inches and weigh over 3 pounds. Spawning: Walleyes spawn throughout April when water temperature is 40-50 degrees. Eggs are scattered over gravel, reef areas, or in the riffle areas of tributary streams. Food: Walleye feed mostly on small game fish or fathead minnows. Adult size: Normally 14-22 inches and weigh 2-4 pounds. May reach 36 inches and weigh over 16 pounds. Cross between male bluegill and female green sunfish. This hybrid produces a quicker growing, lower reproductive, very aggressive fish. Bluegills (and other pan-fish) play a key role in the food chain, and are prey for larger game-fish like Walleye and Bass. Food: Insect larvae and commercial feed. Provides a forage fish to supplement predator growth. May reproduce but is normally restocked semi-annually to boost predator growth. The main spawning season of the fathead minnow is from June through July, and they are in good spawning condition from mid-May to early August. We offer high quality walleye, yellow perch, black crappies, small mouth bass, largemouth bass, hybrid bluegills and fathead minnows. We also offer some game fish that are pellet trained. Our fish are certified disease free including VHS. For your average one-acre pond we recommend that you stock no more than 100 predatory fish (Walleye, Small mouth Bass, and Largemouth Bass). 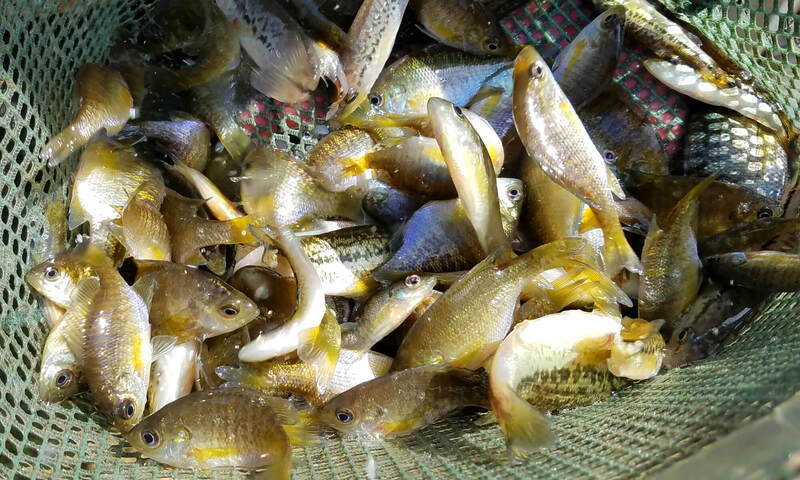 You should not stock any more than 500 prey fish (Hybrid Bluegill, Yellow Perch, and Black Crappies). We like to see people stock fish that go well together in a pond. If you are a pan fish lover then we recommend stocking hybrid bluegills with largemouth bass. If you like walleyes, we recommend stocking them them with yellow perch. If you want Black Crappies we recommend stocking them with Largemouth or Small mouth Bass. We do not recommend that you put walleyes in a pond that is less than 2 acres in size and less than 10 feet deep. All ponds and watersheds are different. Soil types, fertility, age, and water sources all play important roles in the quality of your pond. Use natural techniques to control vegetation as much as possible. Aeration can positively influence the efficiency of your pond.